Home Asia Singapore Singapore Airlines A380 - What's All The Hype? Delivery Of 5th Superjet! Singapore Airlines A380 - What's All The Hype? Delivery Of 5th Superjet! As has been well publicised, Singapore Airlines now has a total of five superjumbos, with the latest Airbus A380 addition being delivered. This jet will be used for SIA's Singapore-London service starting on July 16. Although this A380 will be the second deployed for the London service, it will be temporarily redeployed to SIA's Beijing route to cater for increased demand ahead of the Olympic Games from August 2 for a week. The first A380 on the Singapore-London route arrived at Heathrow Airport in March this year. 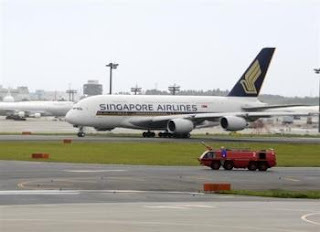 The first A380 jet arrived in Singapore a year and a half late, in October 2007, after it was delayed by problems including electrical wiring glitches. It started flying to Sydney, and the SIA this year also began flying A380s to London and Tokyo. Although the giant plane has the capacity to carry up to 853 passengers, SIA decided to go with a setup of a maximum of 471 seats. The design includes 12 "suites", each with a full-length bed behind sliding doors, sheets by French design house Givenchy and flat-screen televisions. By the time SIA completes it's investment in the A380s, they will own a total of 19 of the superjets. 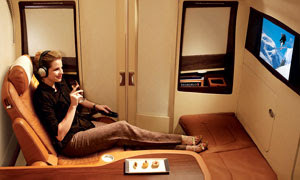 'Beyond the luxury of first class, the Singapore Airlines Suites is in a league of its own in terms of privacy, luxury and personal space. The new Singapore Airlines Suites have been designed by leading French luxury yacht designer Jean-Jacques Coste of Coste Design and manufactured by Jamco Corporation of Japan and Sicma Aero Seat of France. The seat in each Singapore Airlines Suite is almost a metre wide (with armrest folded away) and is fully adjustable with a simple-to-use seat control panel to accommodate a variety of sitting and lounging positions. When the customer is ready to sleep, the cabin crew will make up a full-sized bed with a plush mattress. A lavish duvet and cushions, designed by French fashion house, Givenchy, furnish this comfortable bed. The bed is designed separately into each Suite, and does not convert from the seat itself. Using separate sleeping and sitting surfaces, the intelligent design of the full flat bed offers customers the choice to rest in their preferred sleeping positions, and also allows them to sit and lounge in bed to read or catch movies on their personal 58-centimetre (23-inch) personal widescreen LCD. For couples traveling, the beds in the middle two seats can be converted to an optional double bed. 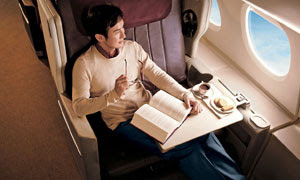 Customers can look forward to experiencing the world’s widest business class seat on the Singapore Airlines A380. Designed by James Park Associates (JPA) of the UK and manufactured for Singapore Airlines by Koito of Japan, the seat has already won acclaim since being fitted to the Airline’s Boeing 777-300ER fleet last year. Because of the increased cabin width on the A380, the seats will be even larger. Measuring 86 centimetres (34 inches) in width, the Business Class seat can be transformed into a comfortable full-flat bed for a good night’s sleep. Innovative design of the bed enhances sleeping comfort, and also allows customers to lounge in bed to watch TV or eat, as they might at home. Seats in the Business Class cabin are arranged in a forward facing, four-abreast (1-2-1) configuration that offers all customers direct access to the aisle. 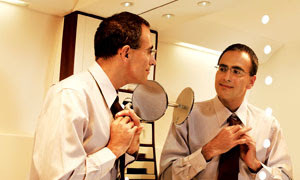 The fixed back shell on every seat can be extended to the sides for greater personal privacy. Other features include a 39-centimetre (15.4-inch) widescreen LCD fully equipped with USB ports and in-seat power, exclusively designed bedding and dining-ware by Givenchy, enlarged dining table that is height-adjustable, as well as trolley bag stowage under the seat. The new Singapore Airlines Economy Class seat offers greater comfort through improved seat design and the use of new, lighter and thinner materials. The new seats, designed and built by Weber (USA), provide more personal space, knee- and legroom. Customers can catch the latest movies on KrisWorld on a larger 27-centimetre (10.6-inch) screen in each seat. A USB port is also available at each seat to allow customers access to the enhanced functionalities on KrisWorld. Other intelligent features include the non-intrusive reading light installed underneath the seatback screen, personal storage space for spectacles and small personal items, a coat hook, foot rest and in-seat power supply. Besides the spaciousness of the cabin, its low cabin noise inflight, and special lighting features in the Singapore Airlines Suites and Business Class, convey a sense of serenity and relaxation. 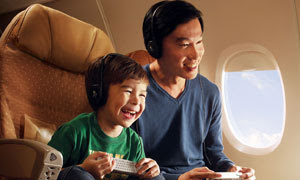 Enhancing the inflight experience is KrisWorld, Singapore Airlines’ award-winning inflight entertainment system. 777-300ER fleet, and will provide a wide selection of entertainment options, including 100 movies, more than 180 popular TV programmes, a library of 700 music CDs, music channels and many learning applications. 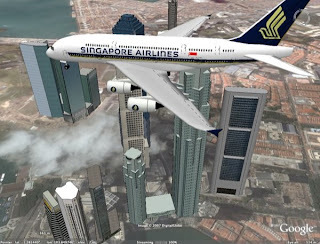 Singapore Airlines is the first airline in the world to offer 3D games on the inflight entertainment system. 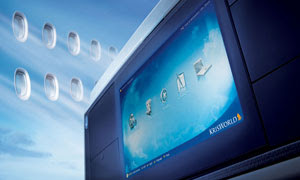 Exclusive to Singapore Airlines, a comprehensive suite of office applications is also available on KrisWorld, allowing customers to work during the flight: they can save their work at the end of the trip simply by plugging in a USB thumb drive. New and exciting menus for all three classes on the A380 are created by top chefs from the Airline’s International Culinary Panel, including Sam Leong from Singapore, Matt Moran from Australia, Gordon Ramsay from the UK, and Georges Blanc from France. Wines are selected by the Airline’s panel of world-renowned wine experts; Karen MacNeil from the United States, Steven Spurrier from the United Kingdom and Michael Hill-Smith from Australia. 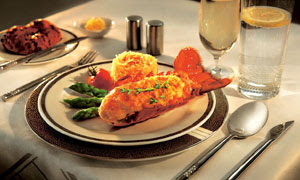 The gourmet experience is further enhanced by the use of exclusive Givenchy-designed service ware in the premium cabins.